Filmmaker Tyler McDonald fell hard for the star of his award-winning documentary the minute the 6-year-old offered to share his skateboard. McDonald understood that after 65 days and 58 nights in the hospital fighting leukemia, Jace Hyduchak was making up for lost playtime. Tyler McDonald tries to make sure every video tells a story. The kindergartener in perpetual motion was breaking in a new skateboard and expected the visiting Grand Canyon University Digital Film major to join in the fun. McDonald, however, did more than play. 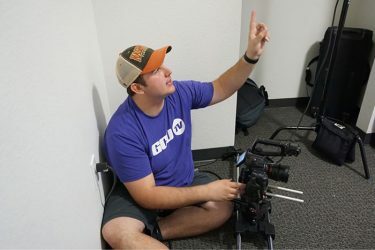 He traded a skateboard for a camera to film “2017 Race Starter Jace Hyduchak,” a documentary of his medical odyssey, his family’s unwavering support and his role as race starter for the GCU Foundation Run to Fight Children’s Cancer, scheduled for Saturday on the GCU campus. All in three power-packed minutes. His film recently won Best Documentary in the 2017 GCU Film Festival. His second film, “The First Step,” was one of three finalists. 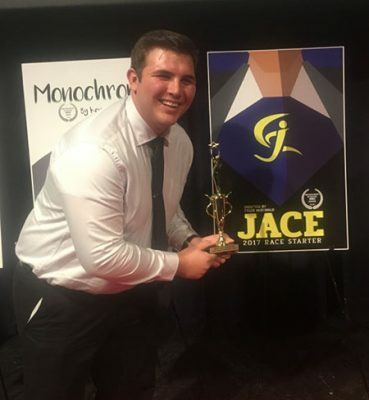 McDonald’s video of Jace Hyduchak and family won Best Documentary in the GCU Film Festival. For McDonald, the win for “Race Starter” validates his filmmaking philosophy. Within 20 minutes at the Hyduchaks’ home in Ahwatukee, McDonald knew their story was award worthy. McDonald was a hard-rock guitar player on track to becoming a music producer until he enrolled in a digital filmmaking class in his sophomore year at Moon Valley High School in Phoenix. His first assignment was creating a 30-second postcard of Chicago. “I had a blast and decided I wanted to make films, not music,” he said. Cost: $35 for 5K, $45 for 10K. Cancer Survivors Walk is free. Benefit: All proceeds are spent locally by Phoenix Children’s Hospital and Children’s Cancer Network. After a tour of GCU, McDonald scrapped plans to attend a college in Los Angeles, the epicenter of filmmaking. “GCU’s been a perfect fit. 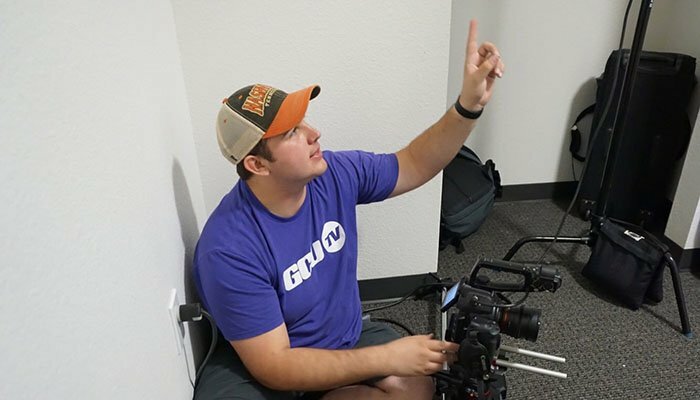 I’ve learned so much inside and outside of the classroom,” said McDonald, a part-time videographer with GCU TV. For the last three years, McDonald has worked on the annual Run to Fight film. The documentary is about the GCU race that has raised more than $450,000 for Phoenix Children’s Hospital and its research into cancer cures and for Children’s Cancer Network (CCN), a Chandler-based nonprofit that supports children and their families. The seventh annual race on Saturday is expected to hit a milestone – a half-million dollars – and attract nearly 2,000 runners. McDonald would like to think his documentary will play a role in the run’s success. “I wanted the documentary to be more than just about Jace. I wanted the documentary to be a call to action,” he said. McDonald’s camera is like a third arm, but he showed up at the Hyduchaks’ home in January to film the documentary emptyhanded. He wanted Jace and his parents, George and Ann, to be relaxed and comfortable before he turned on the camera. “It’s an amazing project and a sensitive topic. You never know how the child and parents are going to react to talking to the camera,” he said. “So I never walk in and just stick a camera in someone’s face,” he said. After playing with Jace and meeting his three brothers, McDonald interviewed George and Ann in their living room. Next, he filmed Jace playing at full speed, shooting basketballs, riding a mini-ATV and jumping on the backyard trampoline with his entire family. A multitasking artist, McDonald simultaneously filmed and edited. “I’m always mentally editing, deciding what fits into the story while I’m shooting,” he said. It’s in the editing room, however, that McDonald does the heavy lifting. He spent nearly five hours painstakingly cutting, adding sound and transforming chaotic bits and pieces into a compelling story. “Film is the most powerful medium, a blend of visual, audio to create a powerful story,” he said. On race day, McDonald will be filming a sequel, capturing Jace blowing the horn to start the runners. He’ll film the Cancer Survivors Walk and the crowds cheering on the participants. For McDonald, the race is more than a film project.